"Time cannot sour, but only mellows him"
Birthday celebrations for Emily Brontë are really taking flight as the Parsonage Museum prepares for a second packed six months of activities. And on the Brontë Society website it has released details of the next few events coming up before the end of the summer. The soundtrack includes Chloe Pirrie, who played Emily in 2016 Brontë biopic To Walk Invisible, reading from Emily’s poem The Caged Bird, and music from folk group The Unthanks. The film can be seen in the Brontë Parsonage Museum, where there will also be Kate’s framed watercolour pictures inspired by Aerial Archaeology photographs of the Yorkshire Dales. A spokesman said: “Emily Brontë rarely left her native Yorkshire and when she did, it was with reluctance. The Brontë Society is teaming up with Bradford Literature Festival to present a special event in Haworth on July 8 from 4pm to 5.30pm. Renowned poet Jackie Kay will return to the village to celebrate the unveiling of her work commemorating Anne Brontë, specially commissioned by the festival, as part of the Brontë Stones project. Melanie Abrahams, this year’s guest curator at the Brontë Parsonage Museum, will lead a walk along Brontë pathways and moorlands on July 23. Since 2016, when the first Wuthering Heights re-enactment was held, up to 500 people have attended each event in Melbourne and Sydney. This year, more than 20 events are being staged worldwide, including 10 in Australia, to mark not just the 40th anniversary of Wuthering Heights and The Kick Inside, but Bush's 60th birthday on July 30. One day in 1891, Miss Mary Taylor decided to open a girls' school in her home. The setting was beautiful: a rambling country house with extensive grounds, surrounded by tall tawa trees, a few miles north of Shannon at the foothills of the Tararua Range. Mary was well-educated, and a music teacher. She and her brother Waring Taylor, both originally from Yorkshire, lived together in his farm homestead. Bruno, originally from the Breton port of Lorient, and now settled in Peel, said that he was greatly inspired by the romanticism movement on the late 18th century, and by his love of writers such as the Brontë sisters and the painter Caspar David Friedrich, and that he wanted to revisit his initial inspirations again. ’This is about the man and the artist that I am now, at nearly 60, painting how I felt when I was 20,’ said Bruno. Shine (China) informs that Wuthering Heights 2011 will be screened at the Shanghai International Film Festival (June 18 and 23); M. Miles pairs Vincent Van Gogh and Jane Eyre. My Jane Eyre explores a facsimile edition of Jane Eyre's manuscript. 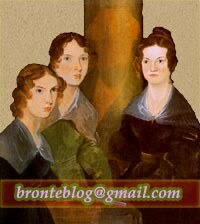 The Brontë Babe posts about Charlotte Brontë's Stancliffe's Hotel.